Although Double Layer 8.5GB DVD-ROM and DVD video discs have been available for some time as part of the DVD read-only standard, it was thought impossible or at least improbable that a similar technology could be developed for personal DVD recording. However, Mitsubishi Kagaku Media (MKM), parent company of Verbatim Corporation, and Philips have recently proven that a Double Layer DVD recording system is feasible utilizing the DVD+R (write-once) format. This technology is named Double Layer DVD+R, or DVD+R DL. DVD+R DL hardware and media products will enable consumers to store up to 4 hours of DVD-quality video, 16 hours of VHS video quality or 8.5GB of data on a single disc—without having to stop and turn the disc.The development of reliable DVD+R DL media materials and manufacturing processes is the key technology enabler for Double Layer DVD+R recording. This white paper discusses each component of the DVD+R DL media structure and the challenges involved in producing compatible DVD+R DL media.The basic challenge was to develop materials and manufacturing processes for multi-layer DVD+R DL discs that allow the properties of two unique layers, once recorded, to meet the DVD read-only specifications for DVD-ROM drives and DVD video players. During recording (and reading), each layer can be targeted without disrupting data on the other layer (see Figure 1). The first recording layer (L0) of the Verbatim DVD+R DL disc is semi-transparent, providing enough reflectivity for writing/reading data on the first layer, yet transmitting enough laser power to read/write on the second layer (L1) by refocusing the laser. Professional CD mastering is first and foremost a decision-making process, and then of course it's about making key changes to the sound. You can kind of look at a mastering engineer as a 'third ear’ guy, an over and above producer if you will. 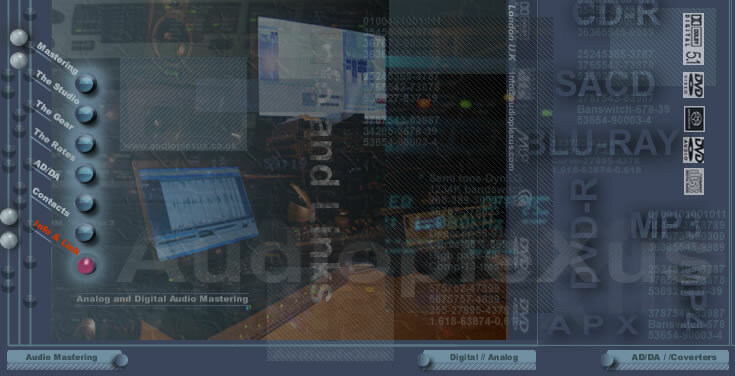 The mastering engineer comes in right at the end of a project and needs to make key decisions, and suggestions on the overall sound and layout (song sequences, pauses, etc.) that will be presented on an album. Producers, audio engineers, A&R persons, labels and artists all trust the mastering engineer to ensure that they put out a top sounding album with maximum impact. For this reason a mastering engineer needs more than just experience in audio engineering, experience in other aspects of the industry is vital. A mastering engineer not only needs a good ear, but also a good feeling for what works and what doesn’t, a good understanding and feel for different genres of music, a good grasp of how to make an album ‘flow’ from the first to last track, and much more. This layer plays the important role of reflective layer for L0—but must transmit enough light to read/write on L1. To provide stable reflective and transmitted light, the thickness of R1 must be precisely controlled.